Yesterday Di, Kylee and I had the privilege of visiting Stonefields School for a couple of hours. 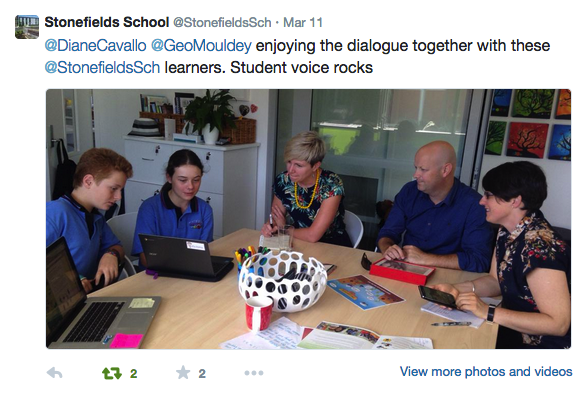 Stonefields have a great reputation for making learning visible and as I blogged about a couple of weeks ago, our team have a focus on developing the usage of our common learning language at HPSS. This post will cover the major takeaways for me from this visit – Sharing progression, seamless use of learning process and learner qualities, vision/leadership, familiar tensions and a collaborative future. Hopefully it will also encapsulate how inspiring Sarah Martin and her team are. Students have Learning Progression documents for Mathematics, Reading, Writing and the Stonefields Learner Qualities. These documents break the curriculum own into student-friendly language and demonstrate what all students need to understand as they progress through the school. One awesome student sharing his progressions with us described them as a learning bucket list. The Progression document shows all the steps at each level and students then colour code it according to where they are at. Green means that they know it and have linked evidence to prove it – video, photo etc. Blue for what you think you know and it is a signal to the teacher that they are ready to get this progression signed off. Yellow shows what they are actively working on learning at that time.Growth outside of these areas is shown through concept folders where students evidence their conceptual progression. This all helps students to work out what teacher led clinics they need to attend and negotiate their learning accordingly. All of this is shared live with parents through a secure portal so they can log in at anytime and see the progress their son/daughter has made, what they are working on now and what the next steps will be. This parent portal also gives access to blogs, assessment and teacher planning. Truly visible practices! Stonefields’ learning is based on their 4 vision principles: Building Learning Capacity, Collaborating, Making Meaning and Breakthrough. They do this through the seamless integration of a Learning Process and Learner Qualities. Their learning process develops students ability to make meaning through problem finding, problem solving etc. Their Learner Qualities are dispositions such as Question, Wonder, Be Self Aware etc. For more depth on both of these see http://www.stonefields.school.nz/page/Learning/. Teachers and students actively talk about how the process and qualities work together to help get students out of the pit when they are struggling with their learning. The learning process including the verbs that unpack each step are everywhere you look in the Stonefields learning spaces. Sometimes in posters, other times in single word form so teachers or students can organise according to their situation at the time. Alongside these on the walls are the learner qualities. Full rubrics of what the qualities can be like allow students to regularly check in on how they can improve. These sit alongside characters that have been designed to represent the qualities and prompt students to reflect on how they are learning. In the younger age classes, students have even drawn their own versions of these characters. All of this adds up to an environment where at anytime if students are stuck, or even just pondering what to focus on next, they will see prompts of the learning process and learner qualities. Students use the language automatically and really exude a sense of purposefulness about their learning. With the learning process and learner qualities being based on the 4 key vision principles it is easy to see the vision in action. The language of the vision is embedded in the school in a remarkably easy way. Now, that sounds to me like leadership I would love to work with! Like us at Hobsonville Point Secondary School and so many other schools reflecting on their practices and looking to improve, they are discussing many of the same tensions. Breadth vs Depth arguments in relation to the curriculum. Building on these familiar tensions and the shared experiences of being in a new school with it’s constant iterations and search for improvement we discussed ideas of working closer together in future. Individuals between our schools talk to each other but in the interests of continuing to improve our practices it makes sense for us to do so more. Perhaps this is a starting point in collaboration between some of the network of newer schools that have been built in Auckland over the last decade? At the least we have invited some of the Stonefields students up to visit HPSS and engage with our students. So, with this all said and done, what are the next steps for us in the Specialised Learning Leaders team and HPSS as a whole? We continue with our efforts to build a common language of learning. Our team has worked with staff over the last 2 weeks to build common rubrics for what analyse, investigate and demonstrate understanding mean across learning areas. First versions of these should hopefully be up soon for teachers and students to start testing and improving. Redesign of our Learning Design Model now adjusts slightly as we look to incorporate the idea from Stonefields of characters to represent different phases. A challenge for us at HPSS is to more seamlessly integrate our use of the Learning Design Model with our Hobsonville Habits. Many times we focus on one or the other rather than how they can work together. Perhaps we even need to consider whether these can somehow work together in the same graphic to more strongly represent how learning occurs? The final inspiration from Stonefields is to analyse what we can learn from their open sharing of learner progressions with parents. It is something that one of our team is working on at present and I know we were very impressed with how Stonefields do this. All of these are my thoughts and interpretations of our visit to Stonefields. I hope I have represented their learning accurately. It was an inspiring visit that has certainly given me an impetus forward and I look forward to seeing what develops out of this visit. This entry was posted in Uncategorized and tagged Hobsonville Habits, Hobsonville Point Secondary School, Learning Design Model, learning dispositions, school, school structure, Stonefields School, Visible Learning, vision by stevemouldey. Bookmark the permalink.